Find out more about the Lorex Weatherproof HD Motorized Varifocal Dome IP Security Camera (LNZ44P4BW) with pricing, features, and FAQs. 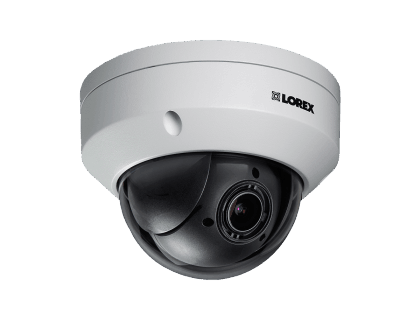 The Lorex Weatherproof HD Motorized Varifocal Dome IP Security Camera is a security camera from Lorex that can be mounted on a wall or ceiling. The camera can also be controlled remotely from a computer, smartphone or tablet. 4x optical zoom for viewing fine details. Pros: Durable weatherproof design. Remote control options. 355° rotation. Cons: Expensive for a single camera. Bottomline: A secure, state of the art security camera that cannot be tampered with. What are some Lorex Weatherproof HD Motorized Varifocal Dome IP Security Camera alternatives? Where can I buy the Lorex Weatherproof HD Motorized Varifocal Dome IP Security Camera? You can buy the Lorex Weatherproof HD Motorized Varifocal Dome IP Security Camera on Amazon, or directly from the Lorex website. Does the Lorex Weatherproof HD Motorized Varifocal Dome IP Security Camera work at night? Yes, the camera is equipped with full-color night vision. Can the Lorex Weatherproof HD Motorized Varifocal Dome IP Security Camera be used in any weather? Yes, the camera has an exterior aluminum casing that protects it from the elements. The Lorex Weatherproof HD Motorized Varifocal Dome IP Security Camera is safe in snowy, rainy, and windy conditions.